Be the first to share your favorite memory, photo or story of Vergie. This memorial page is dedicated for family, friends and future generations to celebrate the life of their loved one. 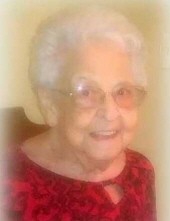 Vergie Mae Carte, 88 years of age from Nicholas County, West Virginia, left her Earthly Home in Villa Rica, Georgia on Sunday, November 18, 2018 to be with her Lord and Savior. She was the daughter of the late Lee Otis and Lula Mae DeMoss and was born on September 11, 1930 in the town of Morris, West Virginia. She was preceded in death by her husband of 57 years, Charles Elmer Carte Senior, and her son, Charley Carte, Jr.
She was the last survivor of her DeMoss family having been preceded in death by sisters, Bertha DeMoss, Beaulah Bail, Carolyn Cavender, Gladys McClung, and Janice Acree. She was also preceded in death by her brothers, Leonard DeMoss, Luther DeMoss, Dana DeMoss, Lonnie DeMoss, and Leo DeMoss. She is survived by her son, Lynn and Sheila Carte of Sutton, WV, and a daughter, Debbie Anderson of Lawrenceville, GA. She was also survived by four grandkids, Michelle Carlock, Jennifer Anderson, Joseph Anderson, and Chris Carte as well as seven great grandkids and one great-great grandchild. Vergie attended Tabernacle Baptist Church in Carrollton, Georgia for the past 32 years. Funeral service will be conducted Wednesday, November 21, 2018 at 12:00 PM from Martin & Hightower Heritage Chapel with Pastor Mary Lou Grimmett officiating. Interment will follow in West Georgia Memorial Park. The family will receive friends at the funeral home from 10:00 AM until the hour of service on Wednesday, November 21, 2018. To send flowers or a remembrance gift to the family of Vergie M. DeMoss Carte, please visit our Tribute Store. "Email Address" would like to share the life celebration of Vergie M. DeMoss Carte. Click on the "link" to go to share a favorite memory or leave a condolence message for the family.